Netflix has long been famous for its “freedom & responsibility” deck—a 124-page document outlining the principles behind their unique company culture. It went viral—over 15 million views and counting— and Facebook’s Sheryl Sandberg called it “the most important document ever to come out of the Valley.” Patty McCord helped write that deck and created Netflix’s unique company culture during her 14 years as the company’s Chief Talent Officer. 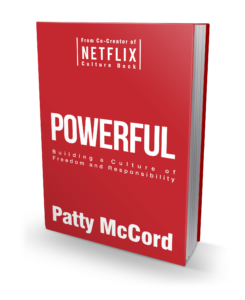 In POWERFUL, she shares what she learned at Netflix—with candid stories of the Netflix culture in action—and teaches leaders how to build their own high-performance cultures that can meet the challenges of today’s rapid pace of change in business.